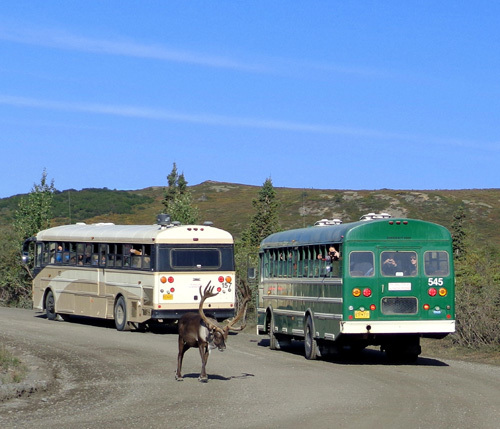 above the park road, and consists mainly of dry tundra and rolling hills . 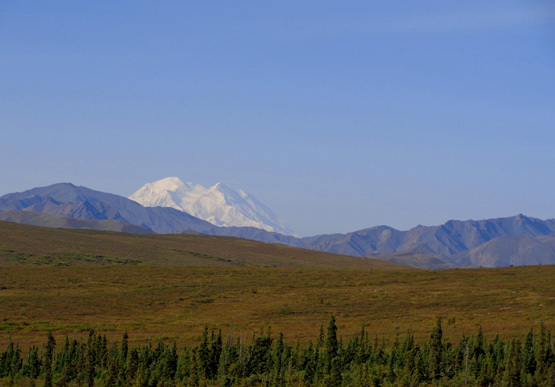 . .
On a clear day, Denali may be visible from the top of the ridge." 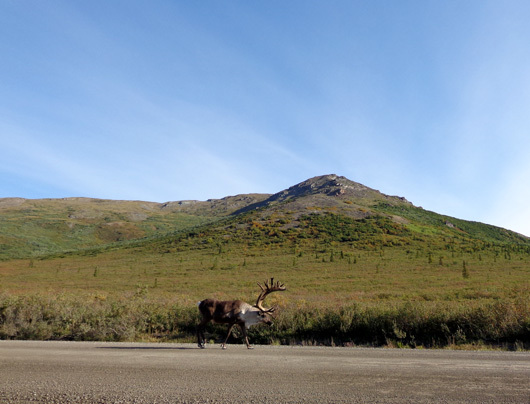 ~ from the Denali National Park website, "Oh, Ranger!" Ha! It's not that difficult. You don't have to hike all the way up there to see Denali, but it's a great hike and I highly recommend it. On a clear day you can also see The High One from the road at the Primrose Overlook at Mile 17�. 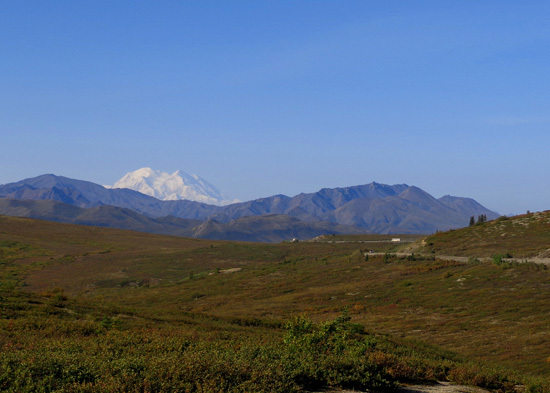 Denali is also very visible from the trail above treeline on the way up to the ridge, all through the tundra on the south side of the ridge, and from the summit of nearby 5,059-foot Mt. Margaret, which looms over the western side of the canyon through which the Savage River flows. The advantage of hiking above the road is being able to see more of the mountain's lower slopes. I'm glad CJ, our campground host at Riley Creek, suggested we go up there. I wouldn't have thought about hiking in this area without his tip. I never saw any information about the Primrose-Margaret trail in the park literature we picked up or even on the park website. Only later when hunting for a quote for this entry did I find the Oh, Ranger reference, and some non-park sites written by individuals who hiked the ridge, on the internet. This will be another multi-page entry. 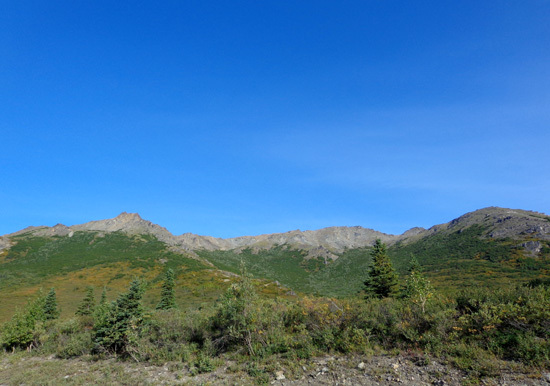 I took a gazillion photos again during this hike because of the superlative panoramic views not just of Denali but also the surrounding terrain -- and close encounters with a curious moose, three bull caribou, and four Dall sheep. This was another near-perfect weather day with sunshine, just a few clouds, more wind, and temps in the 60s-low 70s F.
Except for the wind, we couldn�t have asked for better weather for today's hike and bike ride. 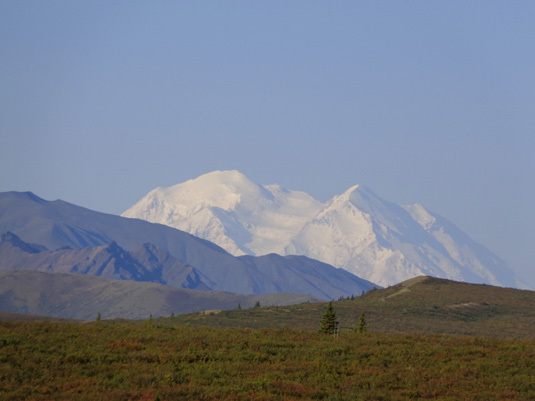 Denali was �out� several hours longer than usual � until about 3 PM from the NE views we had � even when other peaks in the Alaska Range had clouds hanging over them. Just awesome, and pure luck. When we made our campground reservations last December 1 there was no way we could possibly know what the weather would be while we were at the park. Jim and I both took advantage of the good weather, fine views of Denali, and our last day at the park by doing our longest ride and hike so far this summer. Jim was better prepared for his ride than I was for my hike, which turned out to be very strenuous the last two or three hours because of some mistakes I made in route-finding. Those green mountain slopes that look so nice, smooth, and easy to hike from a distance? Trust me, they aren't. from this ridge on Mt. Margaret, should it?? Keep reading to see how that bright idea worked out . . .
We drove the truck out to the far side of the Savage River bridge at Mile 15, as far as we can drive our own vehicle. We got started cycling/hiking about 9 AM. 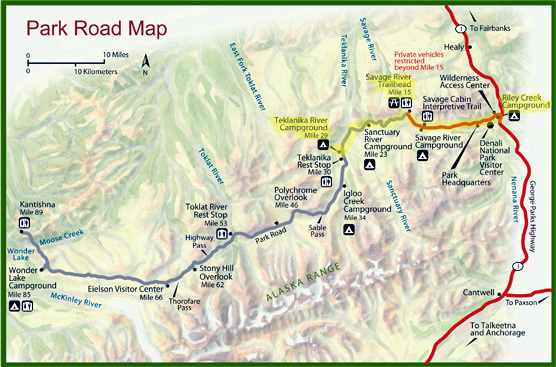 Denali-the-Mountain is off the map to the lower left, between Eielson and Wonder Lake. Primrose Ridge and Mt. Margaret aren't marked on that map. They are located on the north side of the park road just west of the Savage River, about where the picnic/restroom symbols are located at the end of the paved (red) part of the road. Unfortunately, I wasn't able to descend on this side. It would have been a nice shortcut. 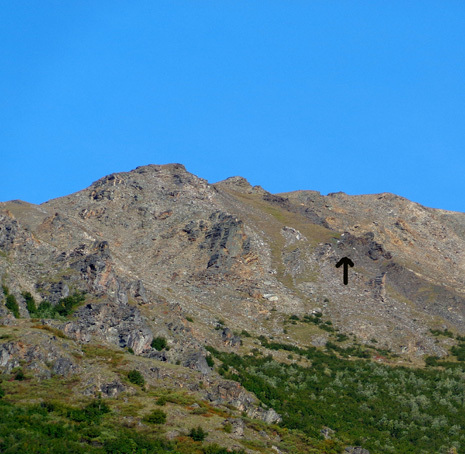 The rocky slopes on either side of the Savage River are reported to be good places to spot Dall sheep. I'll have some good close-up shots of Dall sheep on a subsequent page. 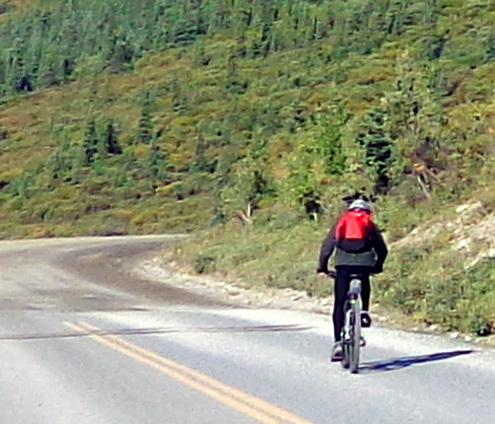 Jim rode his bike 14+ miles southwest to the Teklanika River CG, where we camped for several days last week. He rode through the loops to see who was still there and refilled his water bottle. The long, gradual hill up from Savage River was easier for him this time because he knew the distance is 2� miles to the Primrose Overlook from where we parked the truck. That concept holds true for long ascents in foot races and hikes, too. Knowing the distance doesn't make an ascent shorter, just easier mentally because you know there's an end to it. and the road is smooth dirt from Mile 15 � to Mile 92. I had to walk up that long hill on the road to access the trail up to Primrose Ridge and the summit of Mt. Margaret. I don't know of any other human trails to get up there. 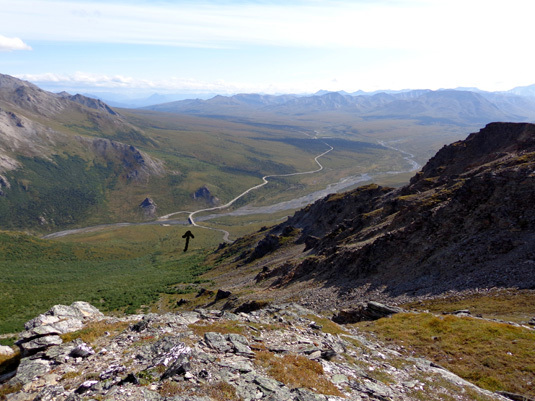 Believe me, I hunted continuously from both the road and the tundra and didn't even see any distinct animal trails. We started at 2,626 feet elevation at the bridge where we parked and went up to about 3,200 feet at the Primrose Overlook at Mile 17� . Primrose Ridge is in the background. That may be Mt. Wright; Mt. Margaret is well to the right. Jim got to the overlook well before I did and was gone when I reached that spot. 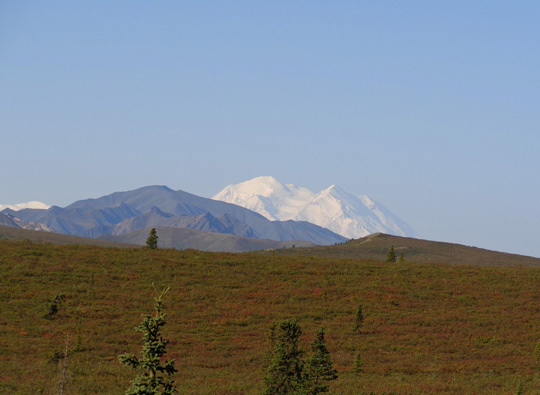 We both did the same thing � got a good view of Denali, listened briefly to the ranger, then went our own way. 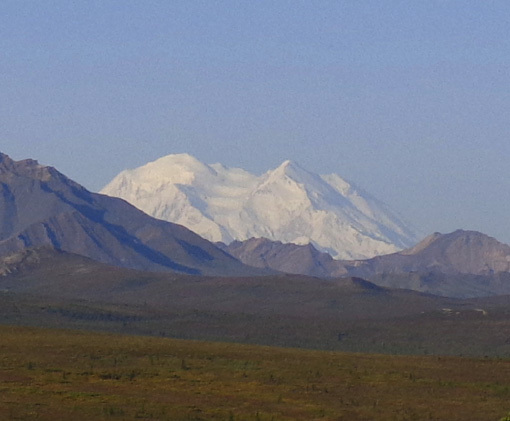 Another clear view of Denali this morning when I reached the Primrose Overlook about 10 AM. Before we got to the overlook, however, we both had a bit of excitement. 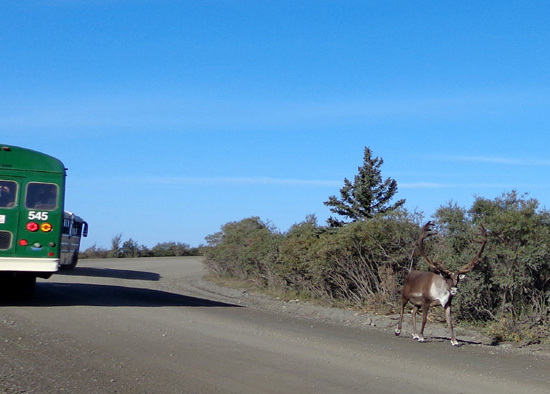 On the way up the road we both saw two separate bull caribou walking on the road. The southern end of Mt. Margaret's ridgeline is in the background, with Primrose Ridge to the left. 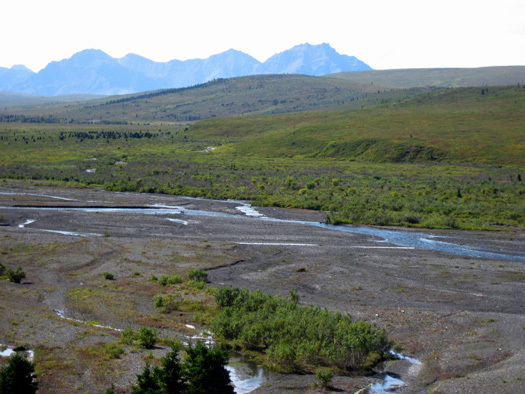 The western end of Healy Ridge is in the background; it's on the other side of the Savage River. Big Five lesson learned: when you're busy watching one critter there may be more in the vicinity! That's an important safety point, as well as a useful tip for photographers. 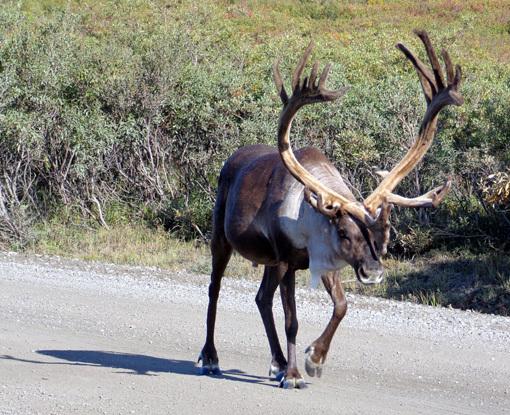 He appeared to be about the same age and size as the first guy and also sported a large, velvety rack. 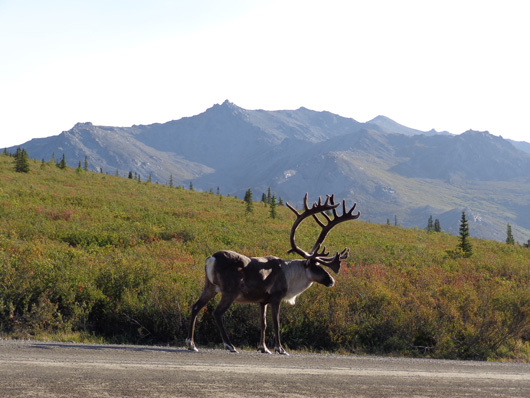 Both caribou passed within about 20-25 feet of me, which is three times closer than rangers advise being to most of the wildlife in the park (much farther away for bears and moose). I didn't have much choice because the shoulder of the road on my side was steeply sloped down. I just stood still, talking to them quietly as they approached and continued on past me like I wasn't even there. They were walking at a leisurely pace and appeared to be totally unconcerned about my presence. 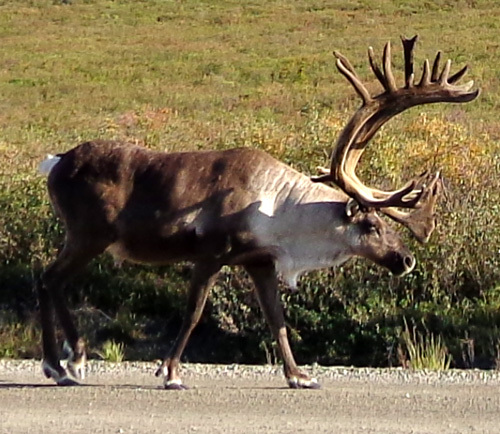 I also saw a bull caribou on the road about this same spot as I was finishing up my hike late in the afternoon. I'll show you a picture of him on the last page of this entry. 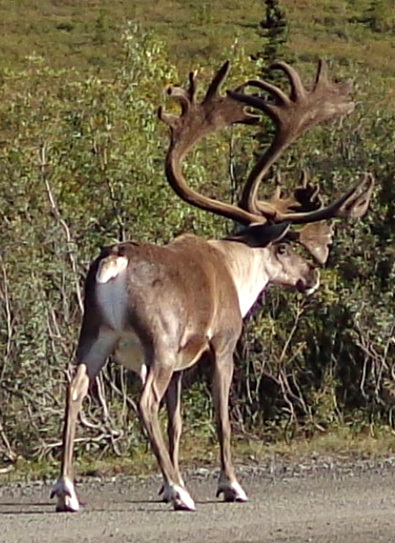 This website has some great information about caribou and other species of animals in Alaska. Click on the various tabs like "life history" to learn more about their habits. I'm pretty fascinated with caribou, since this trip is the first I've seen them in the wild. 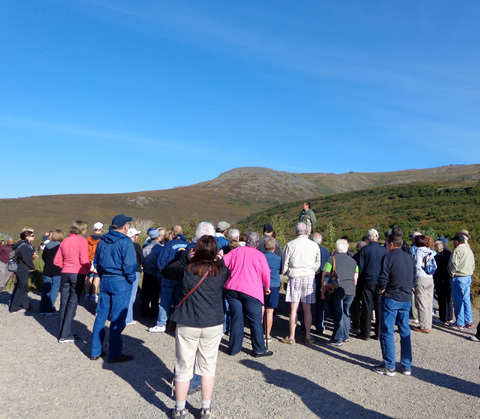 There was also a female moose along the road this morning before we reached the Primrose Overlook, the first we�ve seen at Denali. 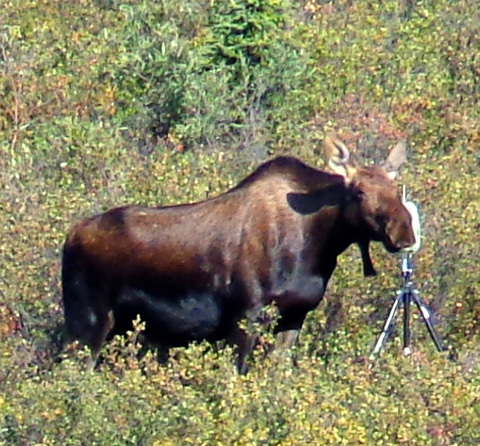 I didn�t notice until I zoomed in on the pictures on my computer tonight that she was inspecting a camera set up on a tripod in the willows! Smile, Ms. Moose! I think you're on Candid Camera. Hmmm . . . better check this out. Never mind; it isn't edible. There was at least one other camera near the road in the same vicinity. Jim saw it, too. We assume it�s a common area for wildlife to be in the road and the park is monitoring their activity for various reasons. By the time I walked past the spot where she entered the dense willows I couldn't see her any more. 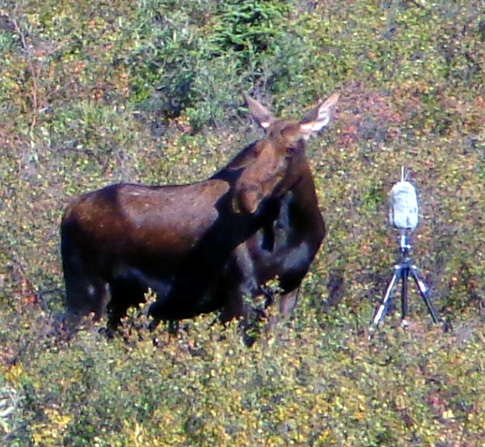 That was our first and last Denali moose on this visit to the park and Jim didn't get to see her at all. That's OK. 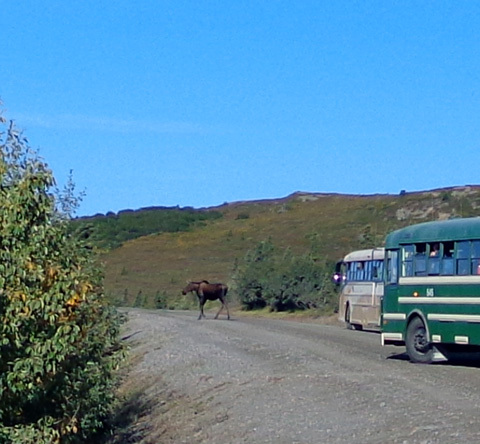 Tomorrow we're going back to Anchorage and we'll probably see several moose in town and at the JBER campground again. How ironic! Doubt we'll see any lynx in the city, however . . . When Jim got done at Tek he turned around and rode his bike back to the truck at Savage River. He loved all the great views of Denali, mostly going outbound. He left me an upbeat note re: what fun he was having, then headed toward our campground. He stopped on the east side of the Savage River bridge to see what the folks in the buses that were stopped there were looking at. More caribou? 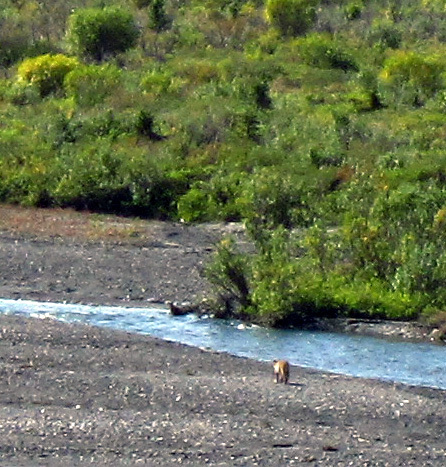 Nope � a large lynx walking on the river gravel!!! 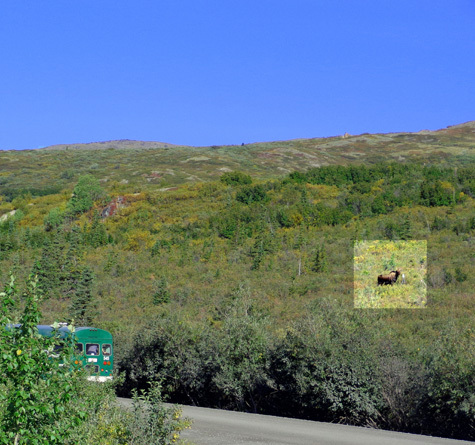 He thought it was a mountain lion but there aren�t mountain lions at Denali. 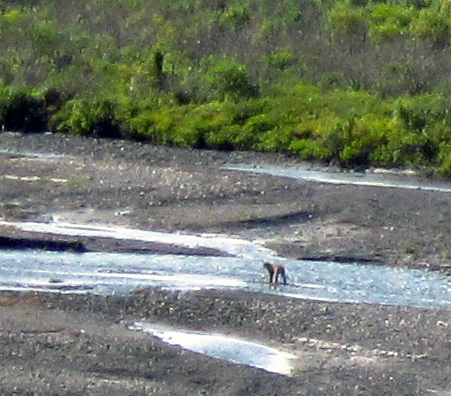 CJ verified that a very large lynx frequents the bridge area. As I�ve said before, next time we come up here, we�re going to have a much better camera than the ones we have. Seeing the lynx was a highlight, much as seeing the wolves last week. We never expected to see either species. 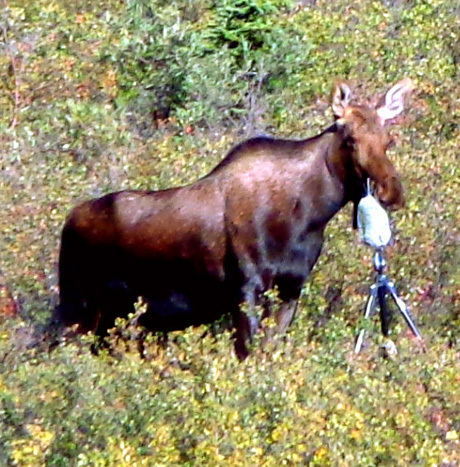 We did expect to see a lot more than one moose at Denali in eleven days. Neither of us saw any bears today, either. That was unusual for as many miles as Jim rode. Here's more information about lynx from the Alaska Dept. of Fish & Game website, if you're interested in learning more about them. 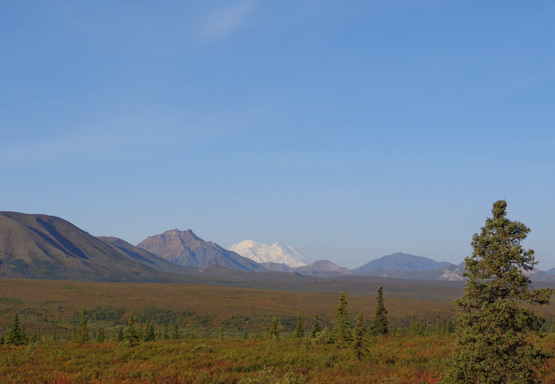 View of Denali about Mile 16, after I saw the two caribou this morning. On the way back to Riley Creek Jim also stopped at the Savage River Campground at Mile 12 for more water. He went back a nearby gravel trail to an historic cabin there (presently used as a ranger patrol cabin) but he didn't take any photos of it. You can read more about the cabin here. 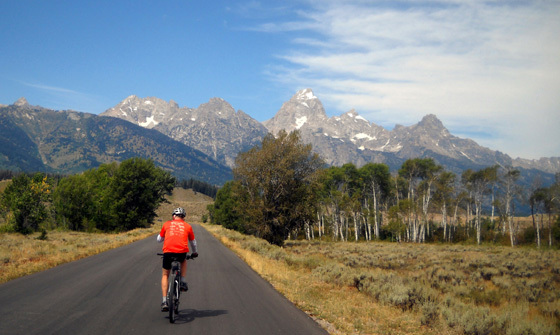 By the time he got back to our camper near the park entrance he�d done 46 miles � and thoroughly enjoyed the ride. He�s already talking about potential bike rides he wants to take �next time� we�re at Denali. Love it! I have more hikes in mind, too, as well as visiting the Murie Science Center. I planned to do that on my way back home today but I didn�t have time.